This hunt takes place on two private free range properties on the South Island of New Zealand. The hut and cabin based accommodation is very comfortable and will make for some great stories around the fire each evening. about our Pure New Zealand - Free Range Red Stag and Bull Tahr Combo package. Here's a platform to really enjoy a great time in New Zealand hunting without the worry of bad weather spoiling your limited time in the country. With 3 touring days and 8 full days hunting, and 4 animals per hunter, this hunt will have to please anyone who enjoys spending some quality time in the outdoors. See our photo gallery for Pure New Zealand Hunting. With over 20 years of professional guiding experience it is hard to go wrong with an outfitter like Don Cameron and Pure New Zealand Hunting. With access to many of the nation's finest private ranches and game estates, Don has the ability to put together some of the best hunting combinations for the outdoor enthusiast. 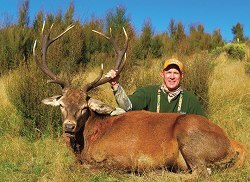 Download our flyer for Don Cameron's Pure New Zealand hunting packages.